This is now home to the Candler County Historical Society Museum. 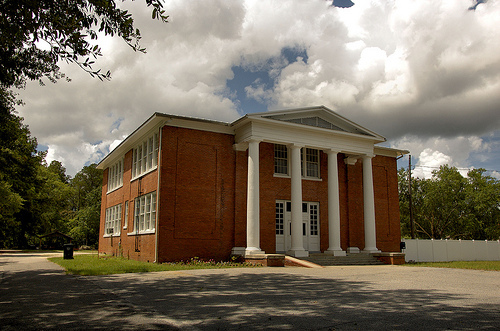 In 1949-1951, this building housed the first and second grades. Possibly other years. I attended there in those years. Mrs. Nonie Holloway was my first grade teacher on the first floor and Mrs. Bird was my second grade teacher on the second floor. If I remember correctly, the Draft Board held their night meetings on the second floor. I went to kindergarten in the old high school building in about 1964. I guess that’s about the time the new high school building was opened up. You’ve painted Metter as nice place to visit, with much history to explore. As always – good job with your lens, Brian. My father’s first cousin, Richard Barry, was the football coach at Metter HS from 1956-1959.